Are you looking for a reliable pattern making software for your tailoring shop or boutique shop? Fashion Dot satisfies the tailoring industry needs of pattern making software and helps your business to function smoothly. Although tailoring business has been making through all these years, in the current period it’s has become quite impossible to run it perfectly considering the huge business volume, situation and stressful time. This tailoring software is so simple, such that it need not require any technician to operate it. It is indeed a great solution that can improve the productivity, accuracy and help you to easily cut through the fabrics without having to miss out the measurements. Everyone is looking out for trendy fashions. This Tailoring Measurement app is capable of generating perfect lines and accurate curves that is important for a fabric to get the perfect fit and shape. In case there are huge number of fabrics which needs to be measured and pattern has to be generated, this software comes handy. This software gives the fabric a professional look and feel. If you wish to work fast and efficiently, you should be choosing Pattern making Software. When a customer walks in to your tailoring shop, the person just has to feed in the measurements once in the tailoring software. This data is stored with name, measurements, delivery details etc in the software’s database. Then the customer can choose the desired pattern from the touch screen or get a customized pattern done. 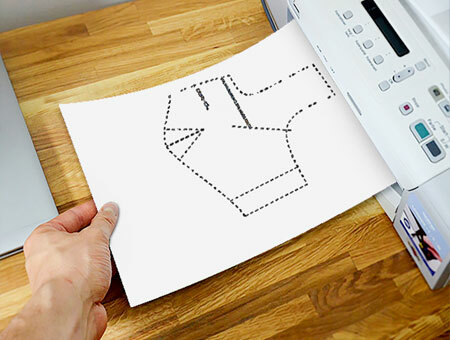 Once the pattern choice is selected, the software prints the pattern in an A2 paper with the help of a Dot Matrix Printer. The printed paper is then given to the tailor. He cuts the pattern on the fabric material and then goes for stitching. If a customer comes back for alteration, a re-work of measuring is avoided as the measurement is already fed into the software. The main advantage of is that the software is instant allowing faster customization thus reducing manual efforts. This software generated pattern can be used on any fabric. Tailoring software allows quick turnarounds and customization at larger scales. Customers do not face fitting problems. Repeated process of reusing the pattern is possible.